Solve real-world real estate challenges. 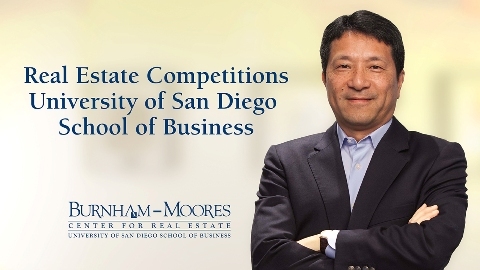 The Burnham-Moores Center for Real Estate encourages graduate and undergraduate students to participate in local and international real estate-related competitions. It's a great way to put theory into practice, build upon your existing analytical and qualitative skills and deepen your relationships with your cohort and faculty. USD teams have been very successful in these competitions. As a result of winning multiple first-place finishes in the international ARGUS University Challenge, our master's in real estate program has received increasing national recognition—and MSRE students continue to excel in this competition. Master's in real estate students have the opportunity to apply what they learn in the classroom and partake in highly competitive real estate case competitions. The international ARGUS University Challenge is one of our favorite and most successful competitions. This challenge brings together student teams from universities around the world to simulate a comprehensive real-life development analysis of a fictitious commercial real estate project. Submissions are judged by a panel of industry and academic professionals and the winning teams receive cash prizes. In the ten years the competition has been held, the USD School of Business team has taken first place on seven occasions and second place on three occasions. We are very proud of our graduate students. USD undergraduate real estate students are invited to take part in the NAIOP University Challenge. The NAIOP University Challenge brings together teams from three local universities to compete head-to-head to propose the highest and best use of a piece of land in San Diego County. The Challenge is based on three areas: a written proposal, a 30 minute Q&A session before a panel of judges from the real estate industry and an oral presentation before NAIOP members, guests and a panel of industry judges. The USD undergraduate real estate team took first place in the 2017 NAIOP University Challenge. View photos of the 2017 event. Master's in real estate students also have the opportunity to participate in the Real Confidence™ University Challenge (RCUC). RCUC is an investment competition comprised of student teams from universities and colleges from across the world. In 2018, 47 schools and more than 290 students participated in the competition. Each university team is allocated one billion dollars in theoretical capital among a variety of commercial real estate investment opportunities within the public and private equity and the public and private debt sectors. Teams compete to win up to $50,000 for their institution by producing the top performing portfolio for the year. The competition is created by the Altus Group. View results from the 2018 RCUC Challenge. View results from the 2017 RCUC Challenge.